1996's Pies Descalzos was Shakira's big commercial breakthrough; it was that album that established the Colombian singer as a superstar in Latin America. But Shakira's next album, Dónde Están los Ladrones? (which means "Where Are the Thieves?" in Spanish) is arguably the finest and most essential album that she recorded in the 1990s. This superb CD isn't just Latin pop -- it's also rock en español. Dónde Están los Ladrones? inspired some reviewers to compare Shakira to Alanis Morissette, but that comparison is only valid up to a point. The Colombiana sings with a bit of a cackle (something Morissette is known for) on pop/rock jewels like "Si Te Vas" and "No Creo," but Shakira is a very different kind of lyricist. 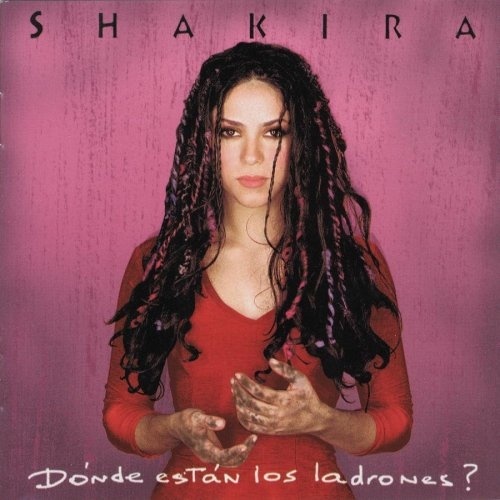 While Morissette is famous for being angrily introspective and having a mad-at-the-world outlook, Shakira's lyrics tend to be poetic and are, at times, unapologetically romantic -- even if Morissette sang in Spanish, it would be hard to imagine her coming up with something as poetic as the Middle Eastern fantasy that Shakira vividly describes on her Arabic-influenced mega-hit "Ojos Así." And, besides, Shakira already had a few albums under her belt when Morissette enjoyed her big commercial breakthrough with 1995's Jagged Little Pill. Of course, only those who have some knowledge of Spanish will be impressed by Shakira's lyrics; Columbia doesn't provide English translations. What will impress non-Spanish-speaking listeners are the CD's attractive melodies and the emotion that the artist brings to her songs; you don't have to speak a word of Spanish to find Dónde Están los Ladrones? musically exciting. If you're acquiring your first Shakira release, this would be the ideal choice.